Wolf Blitzer is CNNs lead political anchor and the anchor of The Situation Room with Wolf Blitzer, which airs weekdays at 5 p.m. ET, providing viewers with in-depth reports about the political, international and breaking news stories of the day. In addition, he anchors Wolf, airing weekdays at 1 p.m. ET, focusing on the most important news from Washington and around the world. Blitzer has been with the network for more than two decades. Most recently, Blitzer headlined CNNs 2014 midterm Election Night in America coverage, providing up-to-the-minute results from key races across the country. He also served as moderator for the U.S. Senatorial debate in New Hampshire, between Scott Brown (R) and incumbent Sen. Jeanne Shaheen (D). Blitzer was pivotal to CNNs election coverage throughout Americas Choice 2012, serving as lead anchor on key primary nights, caucus nights and the Emmy award-winning election night. He moderated three of CNNs Republican presidential debates including the first-of-its-kind tea party debate. During the 2008 presidential election, Blitzer spearheaded CNNs Peabody Award-winning coverage of the presidential primary debates and campaigns. He also led CNNs Emmy-winning America Votes 2006 coverage and America Votes 2004. Furthermore, he anchored the networks coverage during the inaugurations of Presidents Barack Obama and George W. Bush. Blitzer is also at the helm of the networks breaking news coverage covering stories around the country. Most recently, he reported on the shootings from the Washington Navy Yard, the devastation of the Oklahoma tornadoes, the Boston bombings, and the tragedy surrounding the mass shooting in Newtown, Conn. In addition to politics, Blitzer is also known for his in-depth reporting on international news. In January 2013, Blitzer traveled to Cairo, Egypt to sit down at the presidential palace with President Mohamed Morsy. In December 2010, he was granted rare access to travel to North Korea with former New Mexico Gov. Bill Richardson. While in country as the only network journalist, he took viewers inside the communist, totalitarian regime with reports from the rarely seen streets of Pyongyang and Kim II-sung University. Blitzer began his career in 1972 with the Reuters News Agency in Tel Aviv. Shortly thereafter, he became a Washington, D.C., correspondent for The Jerusalem Post. After more than 15 years of reporting from the nation's capital, Blitzer joined CNN in 1990 as the networks military-affairs correspondent at the Pentagon. He then served as CNNs senior White House correspondent covering President Bill Clinton from November 1992 election until 1999, when he became the anchor of CNNs Sunday public affairs program Late Edition with Wolf Blitzer and remained for more than a decade. Throughout his career, Blitzer has interviewed some of history's most notable figures, including U.S. Presidents Barack Obama, George W. Bush, Bill Clinton, George H.W. Bush, Ronald Reagan, Jimmy Carter and Gerald Ford. Blitzer has also interviewed many foreign leadersthe Dalai Lama, Pakistani President Asif Ali Zardari, former Soviet President Mikhail Gorbachev, former British Prime Minister Margaret Thatcher, former South African President Nelson Mandela, among them. In March 2014, he will be awarded the Sol Taishoff Award for Excellence in Broadcast Journalism by the National Press Foundation. Last year, he was recognized as the eighth recipient of the Urbino Press Award from the Italian Embassy for his excellence in journalism. In 2011, Blitzer received the distinguished Leonard Zeidenberg First Amendment Award from The Radio & Television Digital News Foundation, and The Panetta Institute for Public Policys Jefferson-Lincoln Award. Among the numerous honors he has received for his reporting, Blitzer was a part of the CNN team to earn a 2012 Emmy award for the networks coverage of the revolution in Egypt, leading up to and including the resignation of Hosni Mubarak. In addition, he was also vital to the networks efforts to earn the 2006 Emmy-award for live coverage on Election Day. He is also the recipient of the 2004 Journalist Pillar of Justice Award from the Respect for Law Alliance and the 2003 Daniel Pearl Award from the Chicago Press Veterans Association. He was also among the teams awarded a George Foster Peabody award for Hurricane Katrina coverage; an Alfred I. duPont Award for coverage of the tsunami disaster in Southeast Asia; and an Edward R. Murrow Award for CNNs coverage of the Sept. 11 terrorist attacks in 2001. 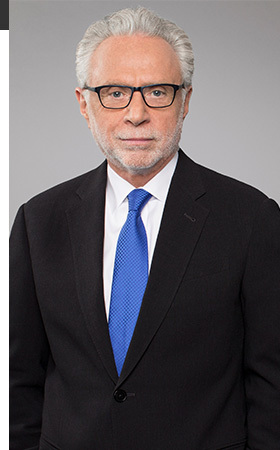 Furthermore, Blitzer is the recipient of an Emmy Award from The National Academy of Television Arts and Sciences for his 1996 coverage of the Oklahoma City bombing and a Golden CableACE from the National Academy of Cable Programming for his and CNNs coverage of the Persian Gulf War. Blitzer has authored two books, Between Washington and Jerusalem: A Reporter's Notebook (Oxford University Press, 1985) and Territory of Lies (Harper and Row, 1989)cited by The New York Times Book Review as one of the most notable books of 1989. Blitzer earned a bachelor of arts degree in history from the State University of New York at Buffalo and a master of arts degree in international relations from the Johns Hopkins University School of Advanced International Studies in Washington, D.C. In addition, Blitzer has numerous honorary degrees from educational institutions across the country, including The George Washington University in Washington, D.C.; State University of New York at Buffalo; The Catholic University in Washington, D.C. and The Pennsylvania State University in State College, Pa. Follow Blitzer on Twitter @WolfBlitzer and become a fan of CNN The Situation Room on Facebook.